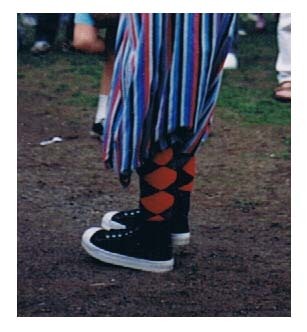 In March of 1989, about two years after I learned to use professional strap-on stilts, I stiltwalked in my first parade: the St. Patrick's Day Parade in Holyoke MA. At that time, the wooden ends of my stilts were showing below my stilt pants, and all along the parade route, smart-alecky men kept yelling at me, "Hey! You lost your feet!" Every single one of them thought that was just so, so funny. And all of them thought they were being oh so refreshingly original, too. So the very next day I put socks and a pair of sneakers on the bottoms of my stilts, and I've never had to put up with that particular problem again. Instead, I continually get nice comments about my shoes. Much more pleasant to deal with. I do have to use screws to keep the shoes on the silts but most people don't really look that close. Besides, I color the heads of the screws to match the shoes, making it even less obvious. However, sneakers wear out pretty fast. Especially the kinds that I like. So since 1989, I've gone through quite a few pairs of shoes. 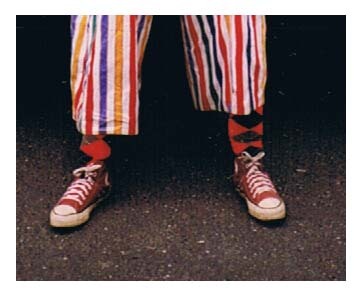 In the following photos, you'll catch all my various stilt shoes (as well as my two pairs of stilt socks and all of my home-made stilt pants, too). 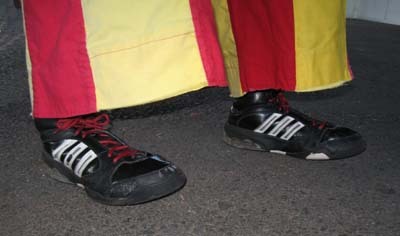 Hope you enjoy my Stilt Shoes Gallery. My public stiltwalking debut was also the first of hundreds (and maybe thousands) of times I got my picture in the paper on stilts. Like all the photos below, this is, of course, only the very lowest portion of the photo. 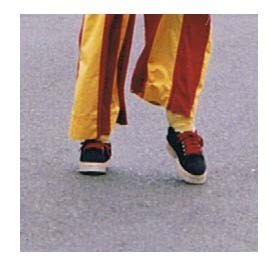 My first pair of stilt shoes lasted longer than any others: 9 years — probably because I stiltwalked less back then. In this photo, someone had commented about my argyle socks, so I'm holding up the legs of my stilt pants so that everyone can admire my cool socks. You may also have noticed that it's a different pair of pants than in the first photo. This is actually the same pair of shoes as the previous picture. 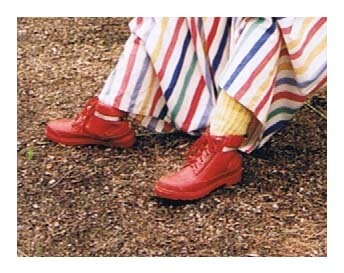 But that winter, when I made my new stilt pants I also put red laces in my shoes. I think it looks better. It also came in handy when I went to a strictly red & yellow & black color scheme in 2001. These red sneakers only lasted about a year. For some reason, I wore right through the heels unexpectedly fast. 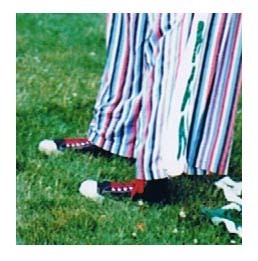 You can also see the new stilt pants in this picture. But still the same pair of argyle socks. The red sneakers in the previous picture lasted only a year, but these red felt slippers only lasted a few months! They lasted so short a time, in fact, that this is the only photo I could find with them in it. (If you look carefully, you can just barely see the toe of the left foot, too.) When I attached them I knew that they were just a temporary lash-up, but they had been sitting in my closet unused for so long! Plus new stilt pants, and new yellow socks, too! I just thought that these were the coolest when I saw them at the discount shop. And I'm pretty sure this event was their public debut. They lasted longer than the red sneakers, but not by much: they lasted a little over a year and a half. Of all the shoes I've had on my stilts, these red plastic ones got the most positive comments... and from both men and women, too. The yellow sneakers were my faves. With the red laces (still the same ones from the original black sneaks! 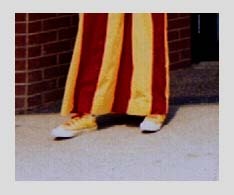 ), they matched my new red & yellow wide-striped pants really well. I only wish these shoes had lasted longer than two years. Although these yellow sneakers were my favorites, pictures of them are very rare. In fact, out of hundreds of photo I have of me on stilts, only two other photos besides this one have the yellow sneakers in them: one is here and the other is here. These black sneakers had very thick soles. I expected them to last a really long time. 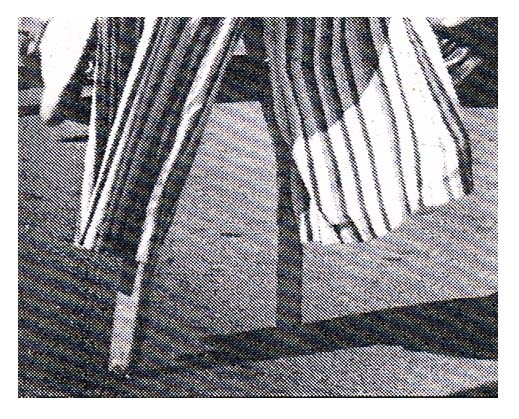 When my stilt shoes wear out, it's always in the same way: the uprights of my stilts are wooden 2x2s and go down into the heels of the shoes, and eventually they wear a 2"x2" square hole right through the soles. So the thickness of the heel seems to be the dominant factor in how long the shoes last. So these elevator shoes had bottoms that were at least 1.25" thick soles with an even thicker heel. But, despite my expectation that these would last about as long my original black sneakers, these shoes "only" lasted about 5 years... still way longer than any of the others besides that first pair, though. These red and black and grey sneakers lasted almost exactly 4 years. They went on really easy (unlike some of the others that were just a bear to attach). They're not as bright as some of my other stilt shoes, but I still like them. They looked good! And since these shoes came with their own round red laces, these are not the same red laces I've been using since the winter of 1989-90, folks! After I attached them, I had to take the right shoe off twice, and it went back on with ease (I like that). Now, why did I take just the right shoe off? And why did I take it off twice? Well... let me tell you. Remember what I told you just above that my stilt shoes always wear out the same way: the upright wears a 2"x2" hole through the heel? Well, I didn't catch it in time with the previous shoes, and the left stilt wore all the way through the left shoe at a gig where I was walking on cement all day. The cement shredded about an inch of wood off the end of the left stilt! It's very uncomfortable to wear stilts that are uneven, so I had to shorten the right leg. But that didn't occur to me until after I'd gotten all excited and put the new stilt shoes on. And, since I didn't cut off quite enough the first time (better not enough than too much), I had to take the right shoe off again to get the stilts the same length. The photos above show the same two shoes four years later. On the left is looking down into the inside of the left shoe. See that square hole worn all the way down to the sole? On the right is the bottom of the right shoe. 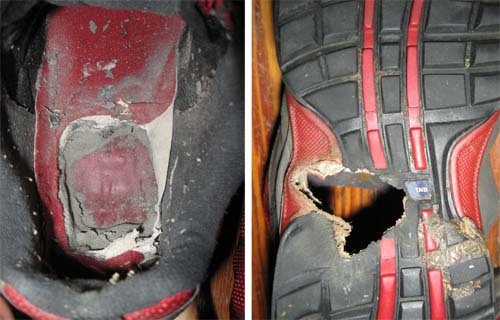 See that hole the upright poked all the way through the sole? It's worn through even further than the one on the left. And that, good people, is why through the years I constantly have to get new stilt shoes. Oy! These sneakers are significantly more heavy-duty than any of my previous ones, and lasted more than 50% longer than most of them. They are also a markedly bigger size. Plus, I put sheet metal "insoles" inside before attaching them to the stilts to (hopefully) make it take way longer for the stilts to wear a hole through these. I'm happy to report that the "bounce back" heels (pictured right) built into the soles of these sneakers make walking on hardtop way less jarring. Nothing like high-tech sneakers! These are the same round red laces as the previous shoes, though. These red sneakers with white and black highlights and black laces are my 9th pair of stilt shoes since I first put shoes on my stilts in March of 1989. At the same time, I also put on a new pair of thick yellow socks --- the first pair of new socks they've had since 1999. (Betcha your socks don't last 20 years!) 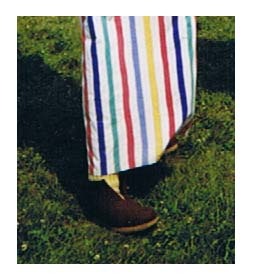 Also appearing in this Gallery for the first time are my brand-new-in-2013 stilt pants. You can see them lots of times on my Stiltwalking Photos page, but this is their first appearance here. Like the previous pair just above, these sneakers also have "bounce" technology in the heels (although they aren't nearly as thick), which make walking so much more comfortable, especially on hard surfaces. I'm pretty sure it also makes the shoes last much longer, too. This appearance at the Springfield RV, Camping, & Outdoor Show at the Big "E" was their debut. When I was taking pictures of them after my show, a crowd of people walking by looked at me kinda funny. I said, "I'm sure all you ladies will understand me taking pictures of my brand new shoes!" They all laughed and chuckled in agreement, and suddenly it was alright.